The Wacom Bamboo Pen Tablet is a low cost ergonomic input device that I use to reduce Wrist Pain – Carpal Tunnel Syndrome. I hold the stylus like a hold a pen and lightly move it around. I wrap the stylus in a rubber – foam insulation so it is about 1.25″ in diameter. This makes gripping it a lot easier. The key to a more ergonomic input device is to try to keep your hand in as close to a natural position as possible. The Adesso USB EasyCat Touchpad is another low cost ergnomic input device that I use. I use my finger to lightly move the cursor around and programmed its buttons to do tasks that require multiple clicks. Wrist Pain – Carpal Tunnel Syndrome is reduced when I used this pad. The Evoluent Verticalmouse 4 is another input device that I’ve recently added. This input device is available in different sizes, which is great because one size does not fit all. It keeps my hands in a neutral position and contains lots of buttons, but took a while to get used to. Roller Mouse Pro is a mouse alternative pointing device that has a roller bar that acts like a highly sensitive mouse. You do not need to reposition your hands to move a mouse, cutting down on excess motion. You can also program the buttons for specific tasks. Wrist Pain – Carpal Tunnel Syndrome can be reduced when using this device. SmartNAV is a hands-free input device that uses your head movement. You can click utilizing voice recognition software or a floor mounted click button. The Kensington Slim blade trackball is another input device to consider. It has a large ball that can be maneuvered with the entire Palm. The buttons can be pushed to the side of your arm. Again, these will not solve all RSI problems. You need to take breaks, do stretching, and minimize computer use whenever possible. Also consider Dragon Speech Recognition software. AutoMouseClicker will automatically click the mouse for you, you can set it to click only after you move the mouse (Hyperclick option) and to wait a certain amount of time. This helps lessen the strain on your injuries from Carpal Tunnel Syndrome. The less clicking the better. Best of all, it is free. Fight wrist pain and Carpal Tunnel Syndrome by using this Automatic mouse clicker. Workrave is a program for Windows and Linux that helps you recover from RSI by forcing you to take breaks. AntiRSI is a Macintosh program that reminds you to take breaks. Of course, the best bet is to try to minimize use of your computer! That works the best. The Pen Again is a low cost ergonomic pen that I tried out at a store this weekend. It feels pretty good in the hand. Wrist Pain – Carpal Tunnel Syndrome makes it hard to write with a regular pen. The key is to make an ergonomic pen so the grip point is large. I have taken a regular pen and put some rubber insulation around it to make it much fatter and hence easier to grip and more ergonomic. 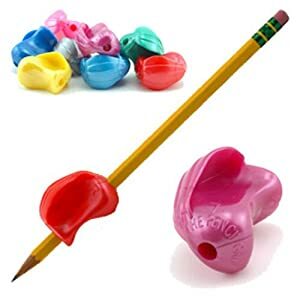 The pencil grip crossover also achieves the same goal. 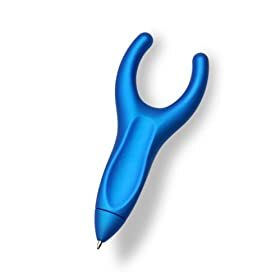 You can use this with pens, pencils, and stylus. I’ve recently used the new ergonomic mouse called the HandShoe Mouse. They have a lot of research on their website from several universities and proof that this mouse has the right shape to prevent carpal tunnel syndrome and RSI. Please take a look too, it might be a good therapy. I know a speech recognition software called Voice Finger (http://voicefinger.cozendey.com) that was designed especifically to heal wrist pain and other disabilities.